It seems everyone loves some kind of music. Music has a powerful influence on the lives of most young people. With this in mind, music is a wonderful medium through which mature emotional behaviour can be experienced and enhanced in all kinds of group activities. It’s part of the journey of discovering and developing ‘tools for life’. Music is a doorway for students – musicians and non-musicians alike – to understand and recognise the value of these tools. Through energetic and interactive workshops and lectures Mark illustrates how the highly developed emotional skills employed by performing musicians can be applied in non-musical situations. Through direct and personal experience, Mark shows how it is possible to apply these understandings in diverse situations – from conflict resolution to everyday student life. 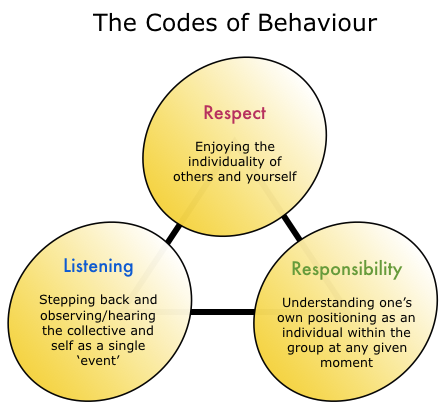 The use of The Codes of Behaviour makes it possible to liberate the creative forces that exist in each and everyone one of us in a team or group situation. Interactive workshops that incorporate exercises that explain and allow the students to actively appreciate the ‘Codes of Behaviour’ – the emotional skills employed by musicians. Gain insights into the forces that are at work when musicians are performing and appreciate that they are relevant and applicable in any situation. Have fun with sound. The students will experience ‘making music’ even if they can’t play a note through the use of unique ‘soundscapes’ composed and produced by Mark that are gateways into making music. Breaking down the underpinning emotional skills that are at work in music performance. The workshops can be themed or adapted to the specific interests or specific events of the school. The outcome of the workshops will be a useful understanding of the three basic emotional patterns going on during good music performance, and the potential to apply them physically, intellectually and emotionally in any team or group situation. Mark is fully CRB checked/approved.